How has contemporary art grown into beautiful, classic and relevant images since the upheavals of the 1940s, 1950s, 1960s and so forth? Did Marcel DuChamp truly have any lasting effect on modern thinking in the arts? Why is minimal art still as pertinent today as when it first emerged from landscape in the 1950s and 1960s? 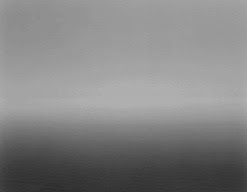 The work of Sugimoto Hiroshi, currently showing at (of all places) the DeYoung Museum is a quiet and brilliant manifestation of contemporary art history. Wordsmith at Griffonage Studios has the best creative solutions to your project dilemmas. Contact us today for a consultation. Yes I agree, the work of this man is truly amazing. The show at the DeYoung is beautiful too. Everybody should see it. Yours is a very good blog. I like the references to modern and post modern art and artists. I guess here, you are expecting the reader to make up their own minds? If so, I do like the artwork of the artist. I have seen this work here in nyc and it is so lovely in its' both qualities reflecting stillness and spirituality. 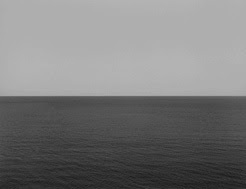 I love the photographs of the seascapes. Sugimoto also does some good work with architecture. I see that you have referenced his web site which is also a wonderful site to browse. I saw an exhibit of these fotos in New York. Gorgeous and a reassurance that minimalism is alive and well.